Most people get these confused with their very similar kin--crunchy, deep-fried spring rolls--but summer rolls really do live up to their name. They're light, fresh, healthy, and chockful of veggies and herbs. 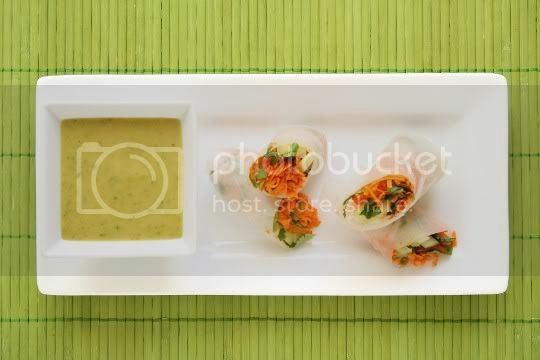 But perhaps the most noticeable difference is that summer rolls are served cold in clear rice paper wrappers. This version is served with a delicious tangy dipping sauce. Perfect for hot weather snacking! Perhaps what I like most about these rolls is that they're surprisingly easy to make. 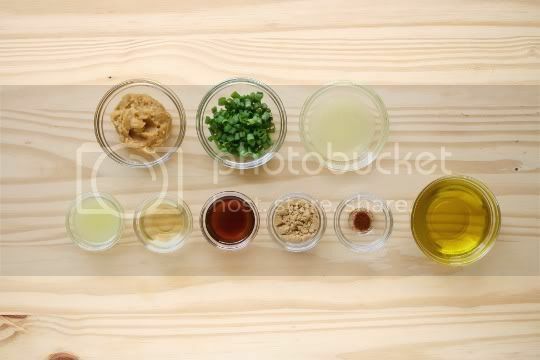 Start by making the sauce, which is just a simple puree of ingredients: miso paste, green onions, lemon and lime juice, rice wine vinegar, sesame and olive oil, brown sugar, and chili powder. Next, make the rolls. Shred about 3 carrots in a food processor (if you have one, OMG this makes it so worth it! 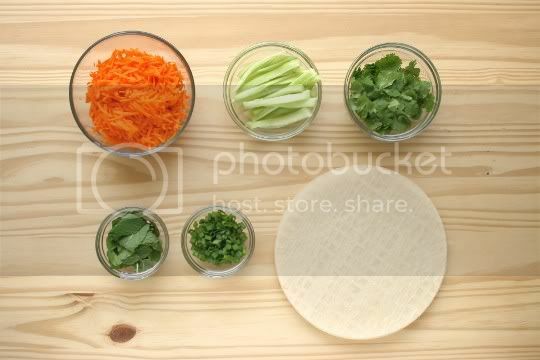 ), and combine that with julienned cucumber, green onions, cilantro, and fresh mint. Although the recipe implies leaving the herbs whole, I roughly chopped mine so they'd be more evenly distributed among the veggie mixture. You can find rice paper wrappers in any good Asian grocery store. They look like big white disks, but the trick is soaking them in water to make them pliable for use. Don't be intimidated, all it takes is a tiny bit of practice. Fill a pie dish with hot water (if you use warm as the recipe suggests, it will take longer), slide the rice wrapper into the water, and let it sit for about 30 seconds. Test the wrapper; it should be loose and thin in all areas, almost like the texture of a thin skin. Remove it from the water, and place it on a damp towel. Place about 2-3 rounded tablespoons on the lower third of the wrapper, fold the bottom over the filling, fold in the sides, then roll the whole thing up like a nice and neat burrito. It may take a couple before you get the hang of it, and the rice wrapper will probably tear at some point, but as long it's around the edges, it's no big deal. These are best served immediately, although refrigerated rolls do fare well for a day or so. The rice wrapper will get a little tough and chewy, but the taste will remain the same. 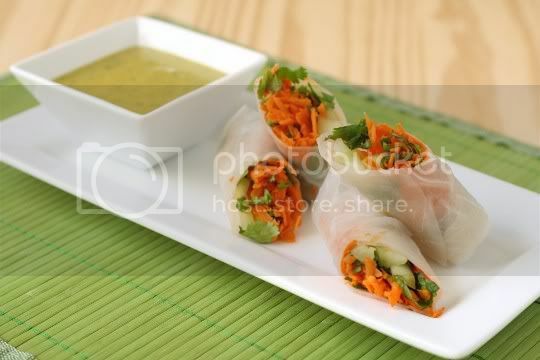 The rolls are crunchy and chewy, with lots of carrots and cilantro. Try experimenting with other ingredients, such as baked tofu, red bell peppers, sesame seeds, etc. Make again? Yes. Quick, easy, and healthy. The perfect summer appetizer! I prepared them today... Simply IRRESISTIBLE!!!! I love the sauce!! I used it with the carrots slices as an appetizer and it was great! Simple but tasty!